Natural coloured diamonds illustrate exclusive elegance of nature. Rarity is the most emphasized property of coloured diamonds. Purchasing a masterpiece jewelry with a coloured diamond, priority of characteristics turnabout, as opposed to colourless diamonds. Colour is the main attribute that distinguish how rare and valuable a coloured diamond is. The most recognized rare colours are saturated pink, blue, and green. Furthermore, even very slight colour difference can have a big impact on value. The rarest type of coloured diamonds are red, green and blue with medium to dark tones in combination with moderate saturation. The brilliance of color, depth, intensity are the most important factors that impact when purchasing a colored diamond. 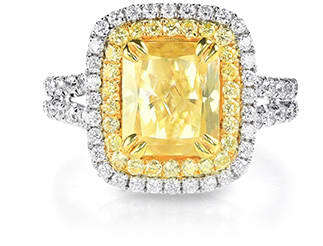 The diamond will be more valuable, respectively to the intensity of the color. Colored diamond’s preciousness can be further intensified with appropriate setting and cut of the stone itself. The cut is self-explanatory, the higher the quality of the cut - the better the color will be reflected when exposed to light sources. Setting of a colored diamond jewelry should be carefully examined and selected by an expert. The synergy of colors is the key factor, for instance, yellow diamond will look better together with yellow gold and rose gold with red diamond respectively. Characteristics of shape and clarity are not equally important as color and cut, but also plays an important role. Shapes of colored diamonds usually come in unique designs to emphasize the color.